1 tin of fresh razor clams. Set aside several large, whole razor clams. Using a mandolin slicer, finely cut the asparagus lengthwise, blanch in boiling water, and cool imme- diately with ice water. Set aside. Mix the liquids together and dress with the soy sauce and wasabi to taste. Add a pinch of salt and pepper and chill. 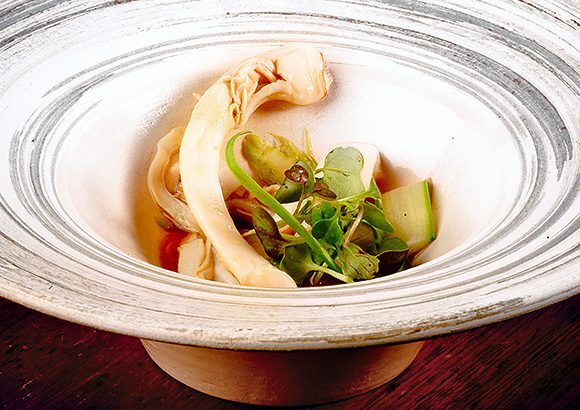 Cover the base of the bowls with the citrus dressing, add a handful of asparagus and a razor clam. Finish the dish with a mint leaf.